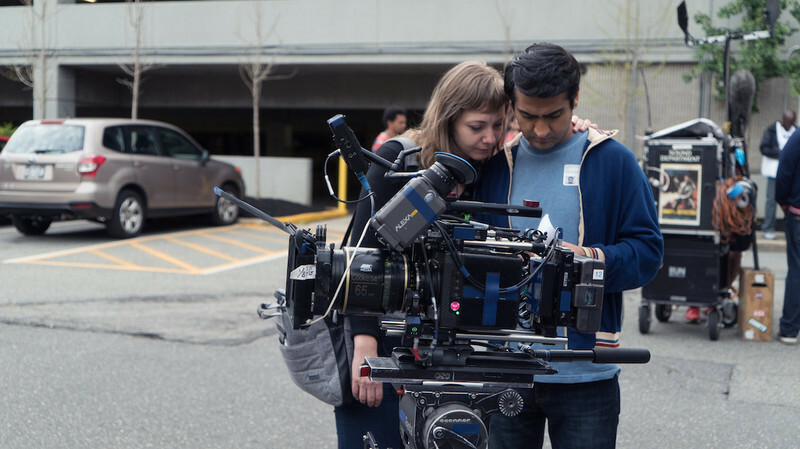 The love story of therapist/writer/producer Emily V. Gordon and stand-up comedian/actor/writer Kumail Nanjiani is the basis for “The Big Sick,” the latest romantic comedy to be produced by Judd Apatow. Directed by Michael Showalter and co-written by Gordon and Nanjiani, it’s a reflection on true events that do indeed make for a great rom-com, like their meet-cute during one of his stand-up sets or the dating expectations from his traditional Muslim parents (played by Anupam Kher and Zenobia Shroff). 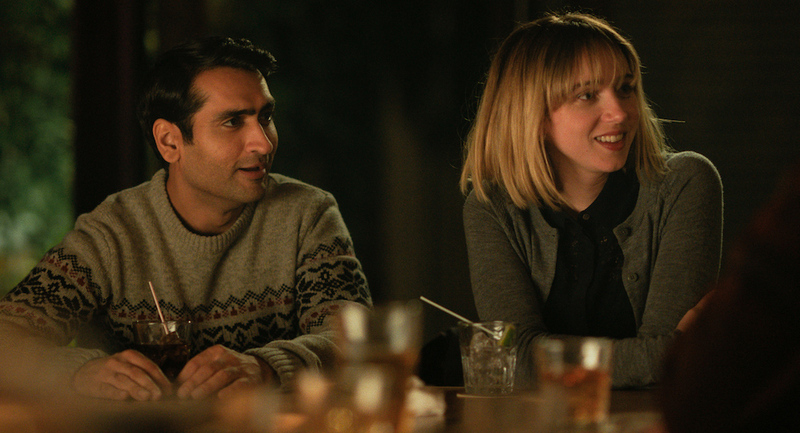 The film gets its title from the moment Nanjiani (playing himself) claims to have fallen in love with Gordon (played by Zoe Kazan), when he was taking care of her during a 12-day coma. While juggling his family and his career, her parents (played by Holly Hunter and Ray Romano) learned to love him, too. Gordon and Nanjiani spoke to RogerEbert.com about their new movie, how they complement each other as writers, and debated whether Emily did indeed have her hair washed while in the coma. Thanks for coming to Chicago with the film. People here like seeing Chicago movies. KUMAIL NANJIANI: People were upset, like, “It’s set in Chicago and it didn’t open here on the first weekend?” We’re like, if it was up to us it would open in every single theater in the world. So, after a long road, your big personal project is out now. Last Friday, it came out. I’m curious—what were you doing Friday morning? EMILY GORDON: Well, press [both laugh]. But have you had time to process it, or stare at a wall or anything like that? KN: No, we haven’t had time to stare at a wall, but that seems like a joy. EG: I’d love to stare at a wall! KN: If you want to take ten minutes of the interview and give that to us to stare at a wall ... but what we did was really cool, we’ve had these screenings and free screenings for all the guilds and stuff, but Friday night we went out to the actual theaters where people had paid money. And went and did Q&As after and most people didn’t know we were going to be there, Friday and Saturday, that was super awesome. it was exciting to see people who were that jazzed, because people who go on opening weekend are different than those who go after a few weeks. There was a difference between regular people who have pre-screenings and regular people who have paid for the movie now that it is out. Because sometimes you do so much press it’s easy to get disconnected from the movie. EG: I literally don’t even remember what we were doing Friday morning. Did the positive Sundance reception help alleviate any stress, regarding how the public would respond? EG: It did a bit. The Sundance reception was great, but it’s a very specific audience. But where I grew up, my theater in my hometown would be with people asking, “What’s playing closest to right now?” You show up, and that’s how you decide on a movie. Those were the type of people that I wanted to make sure we could get. EG: I always go for the underdog. I would way rather be the underdog [laughs]. I’d say you’re still the underdog, especially as a romantic comedy of this size getting released nowadays. KN: Yeah! But I feel like sometimes people now are like, like it has something to prove, or something. KN: But what I think helps our movie a little bit is that it’s very sincere? It’s not like playing that game at all, I don’t think it’s a movie that’s trying to dazzle. It’s just a simple, sincere, story. It’s interesting working with that because there’s some Hollywood leeway you give yourself. I’m curious about how you found that sincerity? Did you ever think about going more organic like a Joe Swanberg route? KN: We always wanted it to be a mainstream comedy. I mean, everybody talks about James L. Brooks, but we wanted that, where it feels bigger. EG: Broad gets used sometimes in a pejorative way, but broad in the sense that your mom would like it. er the movie and I was like, “Look at you!” I told him he’s the youngest person to see the movie. And Judd [Apatow] was really helpful with that, because I think my instincts too were like picking music from stuff, like here are my indie band picks for the the soundtrack. And he told us that he wanted to go bigger and that he didn’t want people to feel excluded by it, and I think that’s a really good lesson that this punk rock kid took, that “Oh that is actually a really lovely kind of way” there are ways to make something very personal, particular and specific, but also accessible. KN: And I think the one thing that we also talked about, where Swanberg is great so he doesn’t fall into this, but you see a lot of indie dramedies that are like kind of funny but also have high stakes and they’re sort of in the middle. And we at least tried to hit highs in both of those. And we wanted the movie to be as funny as a dedicated comedy and the drama to be as moving as a dedicated drama. So the plan and the philosophy was to not be in the middle but to ping pong back and forth. And when you’re making creative decisions, are you thinking about how it worked in real life or only in service of story? EG: Always in service of story. Absolutely. EG: We wanted it to feel emotionally true and it helped that we had been through it because we could like check in, no matter what stuff we invented, it would be like “how does this feel to the two characters?” Who are based on us, given what we’ve been through. And we always have to be in service of the story, we got that drilled into us so hard by Judd and [director Michael] Showalter. Don’t be precious with your story, you have to turn it into something else. And it’s something that the more people that weigh in, the better and better it got. KN: Yeah and by "reality" I don’t mean the reality of our lives I mean the reality of the world of the movie. And really our movie, it’s not that heightened. It’s pretty real … I hope. That also allows moments like when everyone has particularly good timing of showing up at the same place in the emotional climax at the end. That’s a good movie moment. There’s nothing wrong with that. KN: It’s a fine line that you have to walk with that stuff because you want people to be in it. Like for instance, today I was doing an interview and someone said, “That’s not Chicago pizza that you guys were eating.” But, I understand that because the process of making a movie is to kind of keep it air tight. Even if like something small pulls someone out for a second, it’s like the time of the clock jumps or something, but that’s what keeps this delicate reality going. EG: What was it, when we were testing this movie, there were like four people who out of hundreds of people who were like, “Where did Kumail’s car go? He gets into Aidy’s car at the end, how did he get rid of his car so fast?” One of the deleted scenes will be him selling his car [laughs]. KN: See, that doesn’t bother me, because that can happen off-camera. Fill it in! We also don’t all like go pee and poo all the time. EG: No one ever does that because they got stuff to do, man! They don’t want to watch that. Except that you have a poo scene. EG: Yes, we get sick people, we get interracial couples, we get Muslims that are trying to negotiate in American culture. KN: We have religious people who like the movie. EG: What’s the weirdest one? Oh, nurses! Because, and I think it’s fascinating, because doctors all have their specialties, but nurses are kind of there to take care of the person. KN: It’s a very important job. 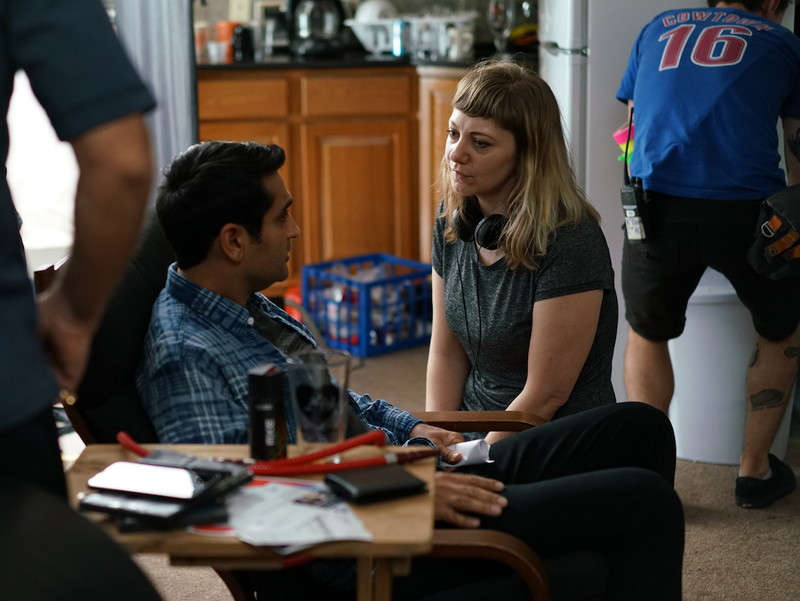 EG: It’s a very important job and someone was excited to see Kumail having these conversations with this nurse and connecting with her. And so I thought that was really cool. KN: I mean that really was the experience, because the doctors are so impersonal. And I’m not knocking on doctors, it’s their job to be impersonal, you know? They have to look at the specifics. But the nurses were really the ones who would care for Emily, the person who cared for us. EG: They’re the person who also has to wash their hair, the person who is truly focused on all of you. KN: … We didn’t wash your hair. KN: I don’t think your hair was getting washed. EG: It was when I was awake! KN: It wasn’t like, “This lady’s in a coma, but still, we have to do her hair. We have to keep it conditioned. We’re gonna lose the waves.” [Emily kicks Kumail] We’re trying to get back to zero. We’re not getting you ready for a pageant. EG: The nurses washed my face [laughs]. KN: [Laughs] Yeah, they would wash your hair, they’d shave your legs, they’d put lipstick on you. By the way, I don’t know why, but that’s a real creepy image. As writers, how would you say you complement each other, especially with your weak spots? EG: I often dwell in the more emotional side of things. I like comedy and I like writing comedy, and I think when I’m in something, I want to stay in it and I think, I don’t know if this would be a good place for a joke. But Kumail is great about going like, “I think we can handle it,” because he knows. He’s done stand-up a lot and he knows that comic timing. And often when I was unsure a joke would work somewhere, Kumail would be helpful. KN: We also found out writing this that comedy and drama complement each other, they don’t fight against each other. If you’re laughing, you’re sort of open and you’re unguarded, and you can get people with an emotional thing. But also if you’re in a really emotional place, the surprise joke can really work. EG: I know, but I think part of it when we’re writing it in the movie, when we’re working with emotional stuff and we’re like “Can’t crack a joke here, that means we’re out of it,” because I’m thinking like a therapist. I just realized that. KN: That are not trying to be funny. For example, the scene where Ray and I were sleeping next to each other, it’s good because that scene is very sincere, and it ends funny, but he’s not trying to be funny. He’s trying to give sincere advice. And that just comes from two people who have really connected and seen each other in ways they really haven’t, and when they try to take it to the next level it doesn’t really quite work. People don’t open themselves up 100% all at once. There’s this connection and he’s trying to give me this dad advice but it’s not quite working. So we did a lot of that in the movie, people propping up against the limits of how much they want to open up. What was the exact moment when you were like, “our story is a romantic comedy”? EG: Now, if this were a movie we’d be like, “Oh, this is so cinematic, you should have been there. It was a beautiful moment.” Yeah, that’s not how our lives work [laughs]. We just had little conversations which is how we make any decision over and over again, each time moving a tiny bit further, about five years ago, which is about five years after all this happened. And then when Judd got involved it was like, “Obviously this is the movie you guys should do,” we were like, “Okay, I guess that’s the movie!” But he was right, obviously. But I think Kumail was more sure than I was that he wanted to turn this into something. I had turned it into a couple of personal essays, but I wasn’t quite sure. KN: I just knew that nobody else had this story. And we knew this story so well, what it was about and the people in it and how it felt to go through it. To me it felt like it could be compelling and so, so specific. I knew that if we did our job right we could make this movie and someone watching it halfway through would be like, even if they didn’t know, would be like, “I think this happened to someone.” Because there’s so many details that you only know if you live through it. A lot didn’t make it into the movie, but some of them did. Next Article: A Little Less Alone: David Lowery on “A Ghost Story” Previous Article: All Roads Lead to This: Edgar Wright on "Baby Driver"